There is nothing better than a cool glass of iced tea on a warm day. 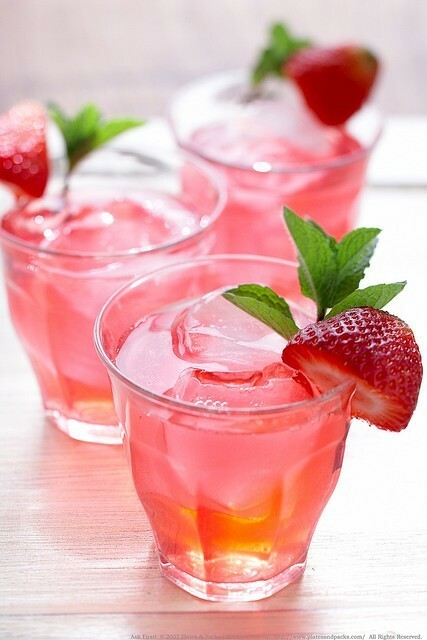 I just loved how beautiful this Strawberry Iced Tea looks. Makes me want to sit on the porch and waste away the day. This looks so pretty and refreshing. Makes me even more ready for spring. oh wow! I put strawberries in my glass of iced tea all the time! I am going to try this!! Thanks! This looks yummy! I noticed the photo has a watermark for a different blog, did you take the picture? I had originally found the image on Pinterest over a year ago. The image linked to someones Tumblr site. I have tried doing further research and I believe the photo comes from Lara Ferroni, however I can't find the image on her site and the text on the image is really small so I'm not 100% sure. Looks delicious! What are the proportions? I can't find a recipe for this tea. It looks delicious---help!!!! Hi Julia! I'm having a pop up Pinterest party featuring all things strawberry! I'd love for you to come over to https://plus.google.com/105344573202432490158/posts and share your strawberry recipes. I'll be pinning all the entries to my Strawberry Board tonight.